Gazef Stronoff knows there’s no way he can win, but he’ll fight Ains Ooal Gown anyway. As Head Warrior he is the sword of his kingdom; if he doesn’t face their greatest foe, who will? All other considerations are secondary. 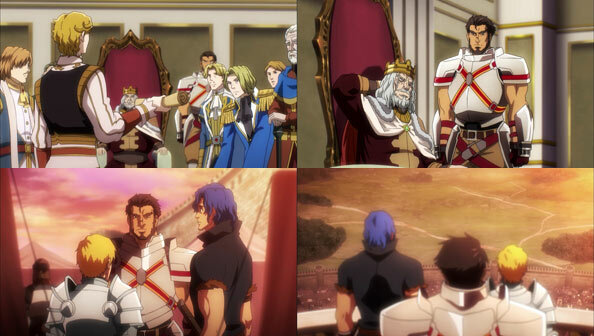 While an argument could be made there was far more Brain, Climb, and other warriors of the kingdom could have learned from Gazef, staying alive to teach them would have meant some kind of surrender against Gown, which his code simply would not allow. Gown defeats him easily by stopping time and casting True Death upon him. It’s pretty anticlimactic, but it’s also efficient, and Gown had no real reason to do further bodily harm to such an impressively stalwart opponent. Emperor El-Nix is driven half-mad by the results of his new “ally’s” overwhelming victory over the royal armies. Climb surmises that Gazef may have given his life as a message to him, Brain, and others not to bother fighting the likes of Gown and instead building a future. Brain ain’t hearin’ it; after drinking with Climb, he’s jumping right back into the fight. As for King Ramposa, with his eldest son gone too long and his second son already jockeying, he agrees to cede E-Rantel to Lord Ains. Princess Renner has a simple task for Climb: to deliver her handpicked roses to the memorial of the fallen armies, flashing her trademark evil smirk once his back is turned to her. 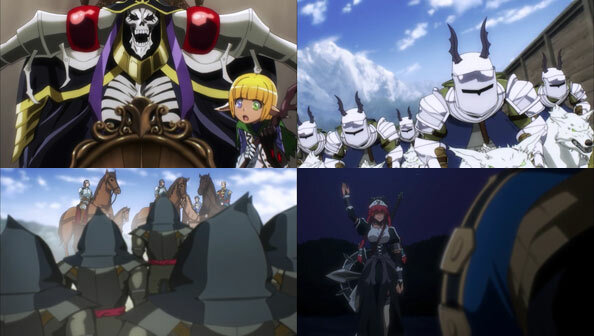 Ains’ dark forces march into E-Rantel without resistance, save a pebble thrown from an angry little boy whose father died in the recent battle. Albedo, who hates humans, prepares to execute the whelp for his disrespect, but she’s blocked by Momon. 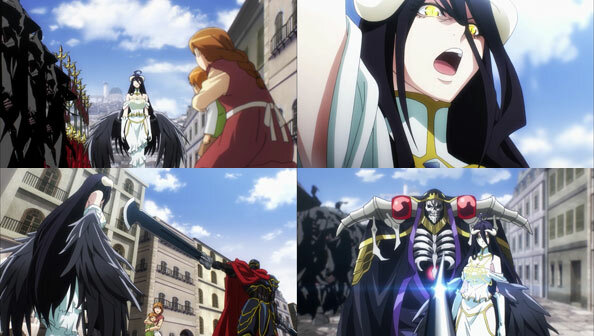 Even weirder, however, is that Lord Ains appears behind Albedo to offer Momon a job as their law enforcer in the city. 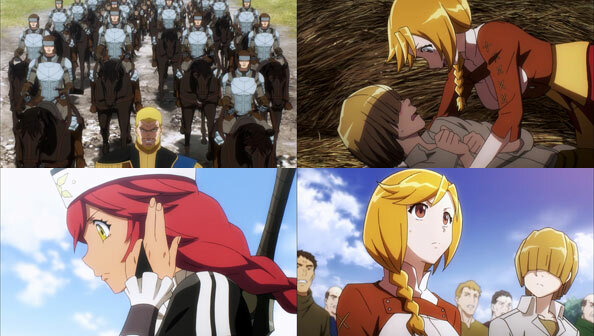 No harm will come to the innocent, as long as Momon makes sure to deal with the guilty. I imagine either Ains simply used a cloning spell or Demiurge disguised himself as Momon or Ains. 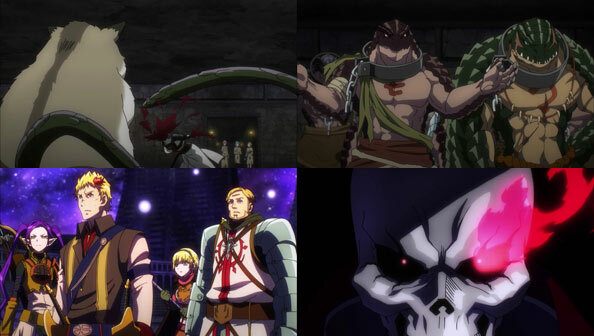 Whatever the deal was with two alter-egos of Momonga being in the same place at the same time, the effect is the same: the townsfolk see Momon as their protector, sacrificing his honor for their sake. I’m sure they’d much rather have an adventurer like him enforcing laws than the myriad undead beasts under Ains’ command. With that, Sorcerer King Ains Ooal Gown takes a seat in the throne room of E-Rantel’s royal palace, all the Floor Guardians and Battle Maids assembled and offering him congratulations on his triumph. But as usual, he didn’t have to actually do much, and a lot of the plan that was just executed wasn’t even his, but Demiuge’s. Still, as far as Demiurge, Albedo, or anyone else in that room is concerned, everything that happened happened because their lord and sorcerer king made it happen. E-Rantel is now the capital of his new “Sorcerer Kingdom”, Ains Ooal Gown. No doubt OverLord IV will deal with the political transition and administration of the city, dealing with any resistance that crops up, and perhaps further expansion of the new kingdom. I’ll be here to watch, as always. In giving Lord Gown the task of giving the signal to start the battle against the Kingdom with one of his magic spells, Emperor El Nix plans to observe how Gown fights in hope of determining a strategy for fighting him, a fight he knows is on the horizon. But as we know, no NPCs, or humans for that matter, have a snowball’s chance in hell against the undead Gown and his minions. To demonstrate just how hopeless it is to resist his might, Gown takes the ball El Nix gives him and runs with it. The “signal” spell, Tribute to Dark Fertility, Ia, Shub-Niggurath, is actually an offering to one of the game’s dark deities. The Empire is outnumbered 240,000 to 60,000, but the tribute ends up massacring seventy thousand of the kingdom’s forces in one fell swoop. Both sides of the battle tremble in fear at what they witness, and anyone with a head screwed on right starts running like hell, including Marquis Raeven. But the tribute was only the beginning of the spell; a great black sphere floats over the masses of corpses and absorbs them in black goo. Five gigantic, many-mouthed beasts Gown calls “adorable baby goats” are summoned, which he believes to be a new game record. As they’re “goats”, the beasts do what goats do: devour everything in sight. Only they’re twenty-story-high goats with more legs and mouths, so they make quick work of the remaining kingdom forces that haven’t fled. Among those who don’t run are whom I imagine to be three of the four individuals Gown has ordered his dark forces not to kill: Climb, Brain, and Gazef. Climb and Brain are prepared to lead a decoy force in order to facilitate the king’s safe return to E-Rantel. When King Ramposa asks Brain what he would ask in return, he wants Climb to be able to marry Renner, which the king approves, though it will mean giving Climb a worthy title. Meanwhile, Gazef tries to take on one of the “goats”, and gives one of them his best shot, but even his badass blue sword can’t make a dent, and he’s sent flying—though not fatally. Climb and Brain end up with Gazef as the goat being ridden by Lord Gown arrives. Gown and Gazef exchange pleasantries, and Gown cuts to the chase: he wants Gazef as a subordinate. If he agrees, Gown will spare the rest of the army. But to agree would mean betraying his king, and as we know Gazed would never do that. Instead, he challenges Gown to a duel. Gazef would rather go out in a blaze of glory than forsake his monarch, but honestly I don’t think it will go well for him…after all, he’s mortal. While his father sent him on an intel-gathering mission to Carne ostensibly to protect his heir, First Prince Barbro is determined to earn the throne through distinguishing deeds, not simply sit back and inherent it (also, he must suspect either the nobles or his siblings will ultimately plot against his succession once daddy’s dead). This would be all well and good if Prince Barbro were good at anything. But reader: He is not. Scratch that: he’s good at making increasingly bad decisions and only quitting when it’s too late to save either his army or his own hide. And it didn’t have to be this way; had he negotiated peacefully with Carne rather than try to kill her, she wouldn’t have blown the little horn Lord Ains gifted to Enri. When Barbro’s troops reform after initially getting their clocks cleaned by Carne’s trained ogres, he forces Enri’s hand, and with no other options and Barbro’s horsemen nipping at the heels of the escaping children, Enri blows the horn, not quite knowing what it will do. Well, the Horn of the Goblin General does no less than summon a massive, 5,000 strong goblin army, extremely well-equipped, well-trained, and unquestionably loyal to the person who blew the horn. We’re presented to wave after wave of (somewhat shoddy) CGI columns of all the various units kitted out in splendid battle attire. Even Momonga/Ains is caught off guard by this sudden development; he had assumed the horn would summon twenty decent goblins at best, but nothing like this. He deduces internally that the size and strength of the army must be determined by the individual blowing the horn; in this case Enri. She already had the loyalty and love of her village and its goblin garrison; the horn thus conjured a suitably badass force. Needless to say, Barbro’s forces are routed and thrown into retreat, though as I mentioned, the order to flee is given too late. Later that night we learn the truth of the matter: Beta “added her voice” to Enri’s horn blow, resulting in the overpowered goblin army (even she was surprised by how big it was). 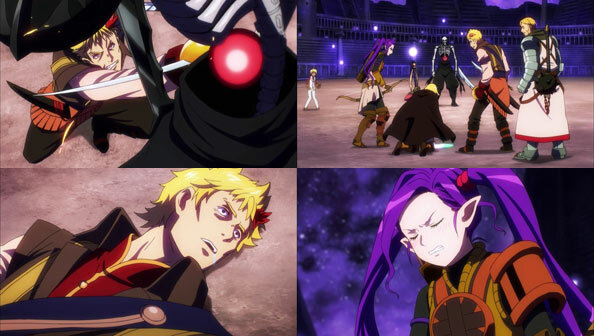 She also nonchalantly (as befits one of the Seven Stars) breaks the bad news to Barbro that his existence isn’t part of Lord Ains’ plans, and so he and his entire force will be massacred forthwith. So it’s R.I.P. Barbro–it’s probably better for the kingdom that he never ascended the throne–and all hail the Glorious Goblin General and victorious Chief of Carne Village, Enri Emmot. May she and Nphirea someday get to roll around in the hay without interruption from incompetent princes. Emphasis on prelude: this episode is all kinds of setup with no real payoff; a calm of political wrangling in the Kingdom before the storm of war with the Empire. 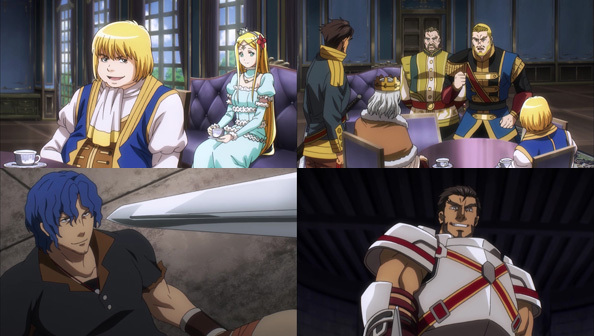 Chief Warrior Gazef Stronoff knows what Lord, er, Sorcerer King Gown is capable of and makes it known to his king, but at the same time knows the king could never heed his advice to simply give up land without a fight. A fight there must be, even if it won’t be like the other wars with the empire, all of them relatively quick, clean, and predictable. In a compromise to the noble and, er, ignoble factions, King Ramposa names Marquis Raeven as the leader of the forces who will defend the kingdom. The ep injects a bit of humanity in the guy by showing how much he loves his son. Unfortunately, Princess Renner has only a moment of screen time and no spoken lines. While Raeven will lead the fight, the kingdom is counting on two months of stalling before the fighting actually begins, so they can prepare as much as they can. 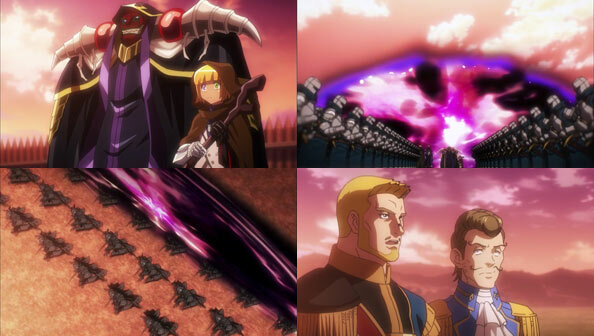 Of course, with another noble estimating Gown himself is as powerful as 5,000 men (five times Gazef’s strength), they face a very uphill battle. 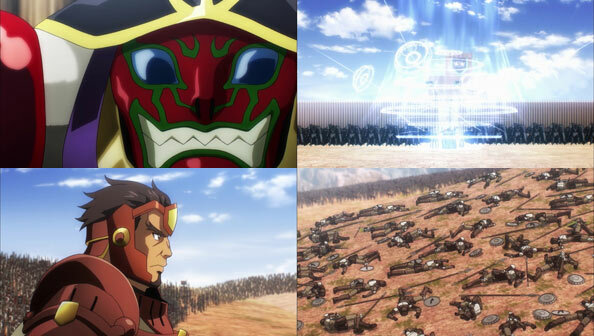 Gazef comes through as honorable and levelheaded as ever, and reunites with his pals Brain and Climb prior to the war. 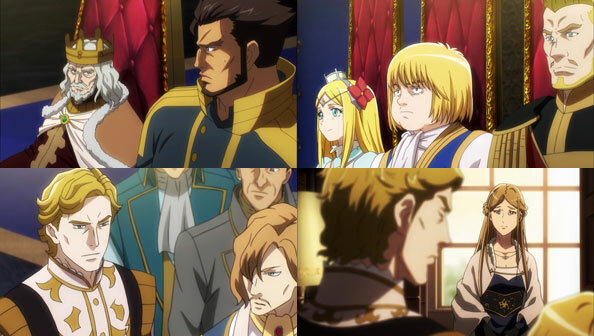 The three agree to meet at a place in the capital to eat, drink, and celebrate when the war is done, but Gazef also warns Brain that he’d better not face off against Gown, or it will be the end of him. 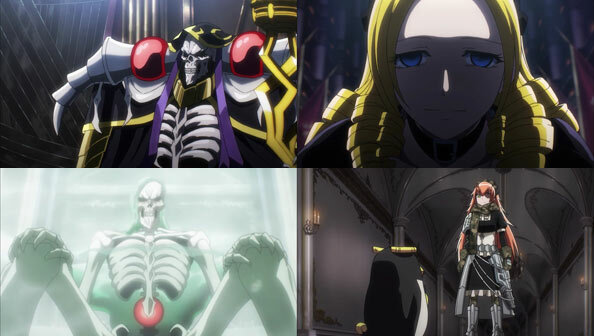 99% of the episode is from the perspective of the opponent Gown has chosen, as part of his (really Demiurge’s) larger plan to gain power and territory for Nazarick. The final 1%, in which Gown takes the field of battle, opens a gate, and unleashes and entire legion of death knights, only comes during the end credits. Renner’s King Ramposa’s eldest son and heir to the throne Prince Barbro, meanwhile, is sent to Carne to gather information, an errand he feels is both beneath him and meant to prevent him from achieving greatness, despite everyone’s insistence he’s the future king. But he should thank his lucky stars if he stays far, far away from the core of the battle in which Gown himself will take part; staying away means he’ll actually be alive to succeed his father. 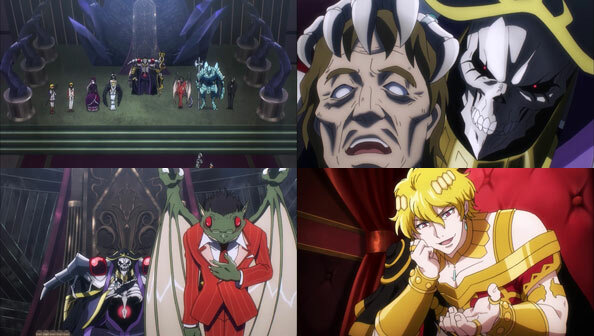 Once Nix & Co. are finally given an audience, things are actually quite cordial until Demiurge (in an animalistic disguise) talks out of turn, taking offense to Nix thinking he can use honorifics as if he was on equal terms with Lord Ains. 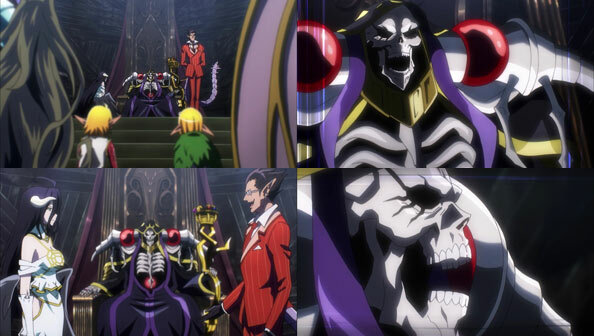 Ains uses Demiurge’s little diplomatic snafu as an excuse to forgive the emperor for allowing his lord to send Workers into Nazarick. This comes as great surprise to the young but cunning emperor, and uses that to suggest an alliance, in which Ains would start up and rule a country, and the empire would assist in any way they can. Ains agrees to this almost too easily for Nix to believe, but decides he’ll take every concession he can get, especially from a would-be foe he has absolutely no change against. Once the two parties part ways, El Nix is confused by the ease with which his head wizard decides to jump into a coach and accompany him back to the capital. Nix knows Flugel well enough to know he wouldn’t be able to resist sticking around to try to acquire some of the immensely powerful magic he witnessed during their parlay. 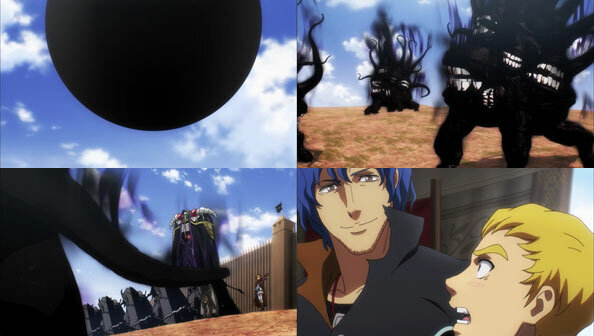 And El Nix is exactly right: behind his back, Flugel has already met with “Momon” and agreed to give him “everything he has” in exchange for becoming the student of a tenth-tier “god.” Not sure he can truly rely on Flugel, El Nix plans to bring all of the human powers together in an alliance against Nazarick, all while pretending to be a friend to Nazarick. 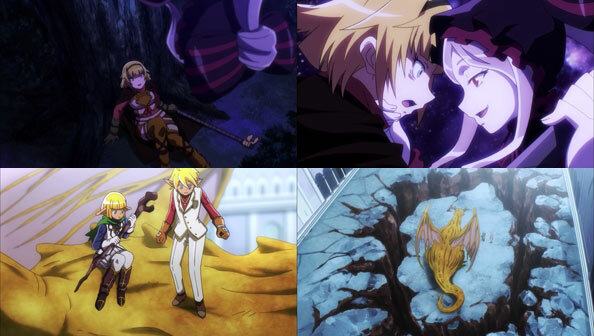 Everything’s all going according to plan…only it’s Demiurge’s plan being carried out, not Ains. Ains actually doesn’t really know quite where Demiurge is going, and since he’s the boss, he can get away with ordering Demiurge to explain everything…for now. If I didn’t know better, I’d say Demi knew how ignorant Ains was to his plan, and was moving against him. Of course, I know better…Demi would never move against his lord…or should I say, Sorcerer King—the winner in the throne room brainstorming session for a new title for Ains once he has his own country to rule. In Demiurge We Trust remains the name of the game, but our gallant band of good-hearted workers end up pawns in his grand scheme to advance Nazarick’s stature in the world, and that leaves a rather nasty taste in my mouth, because they’re very likable pawns with a noble goal. I know there’s a human in Ains Ooal Gown who probably shares some of that taste…but isn’t letting it get in the way of following the plan. In a way, he’s letting himself be a pawn in that plan; playing the role he’s been assigned. The workers know they’re doomed as soon as they walk in the arena. 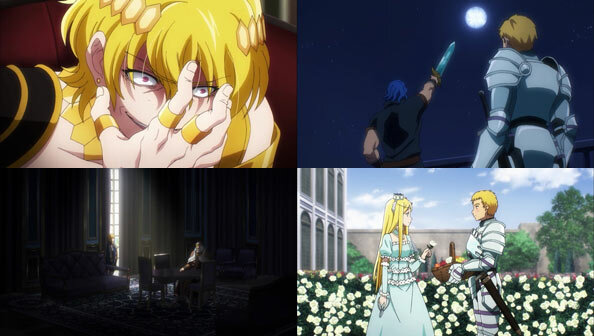 Ains removing a ring so Arche can see how powerful his magic is (it’s powerful enough to make her vomit) only confirms what they already knew: they’re hosed. When begging for their collective lives doesn’t work, the team does their best, but of course everything they can throw at Ains bounces off him harmlessly. The difference in power is simply too overwhelmingly great. So they work to get one of them away: Arche. Unfortunately, while Arche can fly, she has nowhere to fly to; they’re not really outside but on the sixth floor of the tomb. 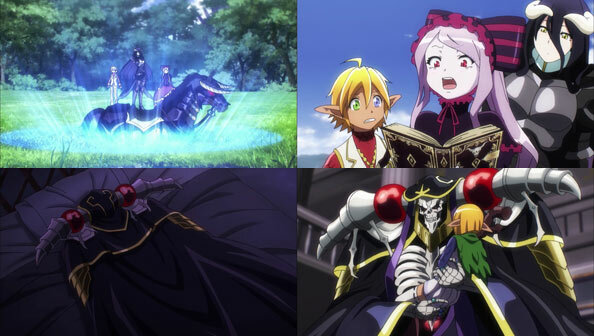 Ains dispatches Shalltear to retrieve Arche and fill her with fear and despair before delivering a painless death. It seems Arche is resolute to the end, and Shalltear failed in the first objective. but as Entoma ends up with her voice in a later scene, using it to describe all the ways her various parts were distributed among Lord Ains’ many underlings, her second objective of killing her did. 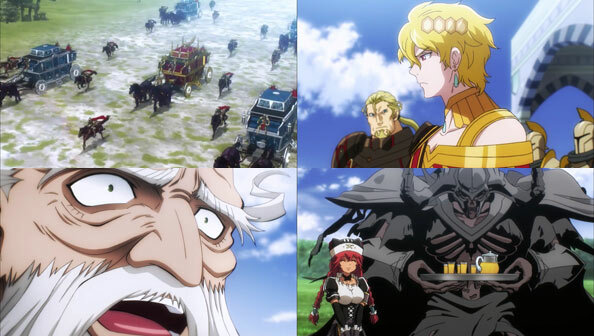 Not long after, the next stage of Demi’s plan is set in motion, as Aura and Mare arrive at the imperial capital on the back of a giant golden dragon to deliver a message—Lord Ains is pissed, and demands a personal apology or he’ll destroy the entire country. To prove he means business, Mare rends a great crack in the ground, and all of the dozens of amassed soldiers surrounding the dragon fall to their deaths, leaving even the proud, fearless young emperor looking dumbstruck. He’ll no doubt have to rely on his grizzled head wizard Paladine at least a little longer. 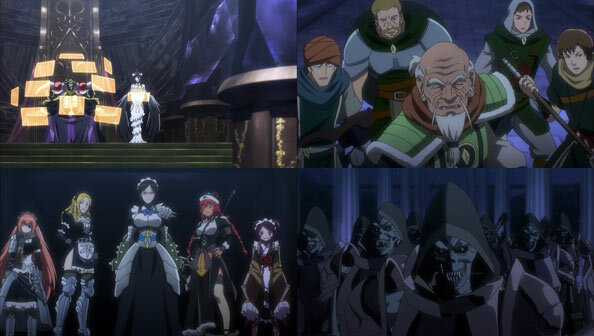 Just as the loose alliance of worker teams begins their infiltration of the mysterious ancient tomb, Momon leaves the rest to Narbarel and teleports back home to Nazarick…which is the tomb all the workers are infiltrating. 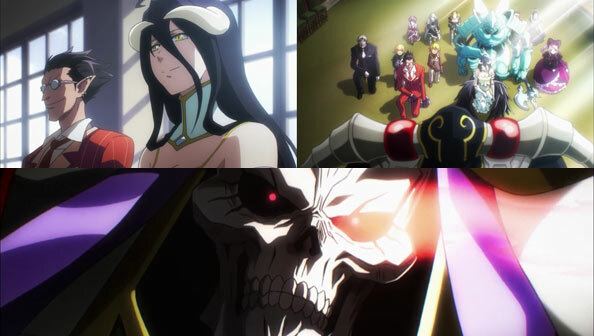 Ains has orchestrated a kind of “open house” to test the mettle of the unsanctioned adventurers, and no doubt this is also part of Demiurge’s larger plan to create a name for Nazarick that will echo throughout the land. 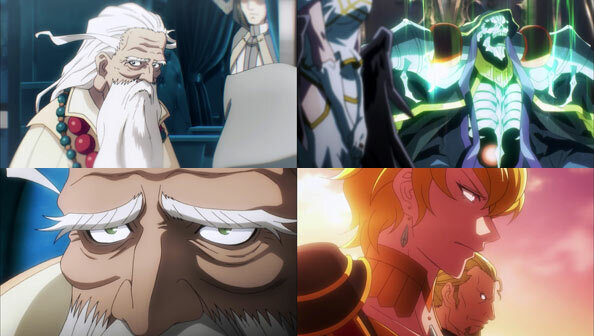 Lord Ains watches from his throne room monitors with Albedo as the teams move in—all but one, led by a grizzled elder who decides to cede the exploration of the tomb to the other teams in exchange for ten percent of what each of them find. In this way, he’s making his party a tidy profit without risking any of his comrades’ safety. Making the other teams their “canaries” would be a great plan…if five of the Pleiades Six Stars weren’t waiting for them outside. 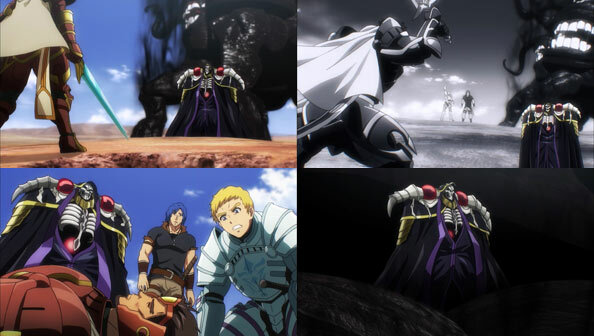 The five-man party would be no match for even one of the maids, but they’re not there to fight, only observe as the undead “Nazarick Old Guards” rise from the ground and take care of business. I must say, it is pretty cool to see so many powerful maids assembled, even if they don’t even lift a finger in the battle. The parties within the tomb don’t fare much better. Some are teleported to some god-forsaken sub-dungeon of the tomb where a Cockroach King (possibly voiced by Hiroshi Kamiya?) greets them enthusiastically before feeding them to his vast “family” (who tire of cannibalism). 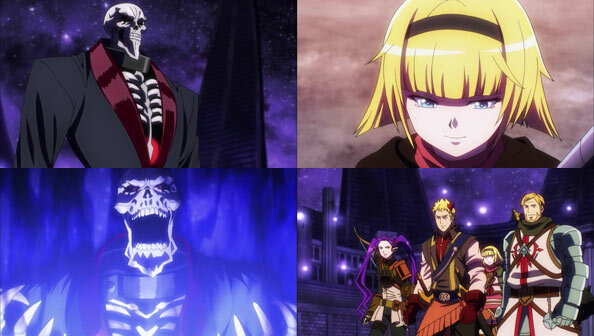 Another unfortunate worker ends up the singular captive of Nazarick’s “special intelligence collector” Neuronist, who fancies herself far more suitable a mate for Lord Ains than either Shalltear or Albedio. And then there’s the samurai-esque shitbag whose name I intentionally did not remember, because I didn’t like the fact he had three elf slaves (whose ears he apparently clipped). Mr. Charming ends up facing off against Hamasuke, who’s been training hard with the Lizardman and has something to prove, which makes him far more dangerous than if is head wasn’t in the game. It’s great to see Hammy in action after so long, and hear his old-fashioned manner of speaking. Hamasuke’s opponent proves no match for his speed, claws, and the Slashing Strike martial art taught to him by Zaryusu. As for the slave elves, after healing and buffing him once, he rushes back in and gets both hands sliced off, and from then on they wash their hands of him, grinning with glee as their master and tormentor is polished off by a giant magic hamster. Thus ends a very small and minor mini-story within the story of a skilled but arrogant warrior who was also a monster. We were shown rather than told what the dynamic was, and were as pleased as the three elves when he got what he deserved. 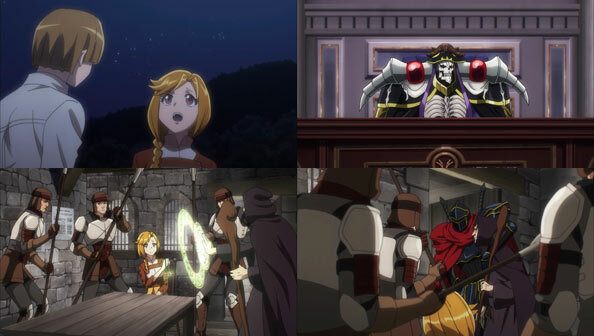 Finally, the team we spend a lot of time learning about last week, led by the pauper noble Arche, end up teleported to an arena, where Aura serves as MC announcing the impending battle between them and the leader of the Tomb of Nazarick, Lord Ains Ooal Gown…whom I’m assuming will be holding back quite a bit. 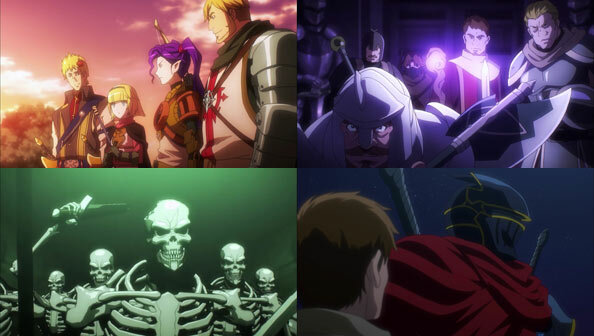 Far from Nazarick and Carne lies the vast, mighty, and vibrant Baharuth Empire, led by the dashing young “Bloody Emperor” El Nix, and backed up by his Court Wizard Lord Fluder and his Four Imperial Knights, whose titles represent the four elements. El Nix orders both parties to investigate Jaldabaoth, whose recent attack on the Re-Estize has led the empire to delay their annual war with the clearly militarily inferior kingdom, as well as Momon, who defeated him. Of course, we know “Jaldabaoth” was merely Demiurge, and Momon is Ains. 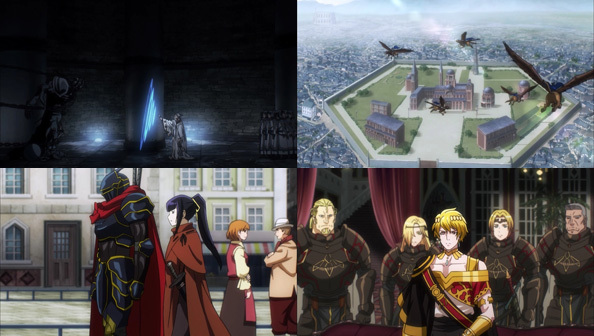 Demi’s plan to make Nazarick a great country and make Ains’ name known throughout the known world is grand and intricate, and involves Ains going to the imperial capital Arwintar as Momon of Darkness, with Gamma AKA Nabe in tow, the Adamantite adventurers on the prowl once more. Meanwhile in the kingdom, the eldest son Prince Barbro attempts to insert himself in a position of power above his younger brother and his sister Princess Renner, neither of whom seem too concerned. Barbro takes offense to a commoner like Gazef having his father’s noble ear. Gazef endures Barbro’s barbs and later spars with Brain Unglaus as a delighted Climb observes. 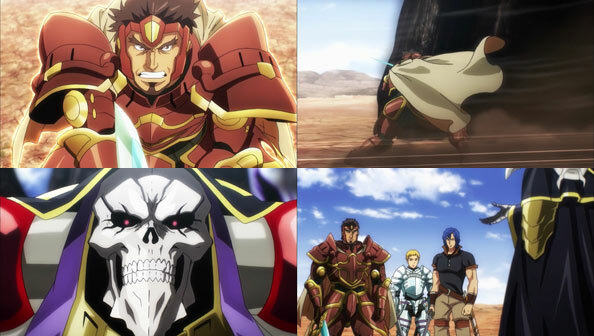 Gazef is by the king’s side, while Brain and Climb are by the princess’. Big or small, they’ll doubtless all have roles to play in this new arc. 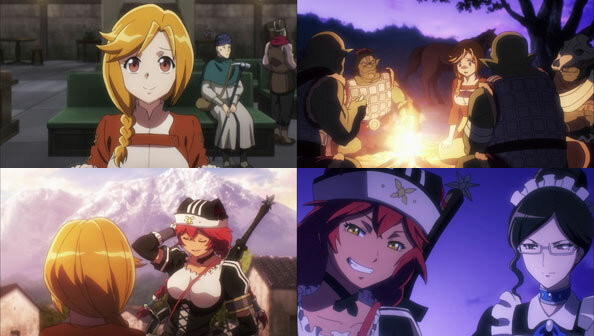 The episode than shifts to yet more new faces: the four members of Fortnight, one of the many teams of “Workers”—mercenary adventurers unsanctioned by the guild. Workers do the jobs official guild adventurers either can’t or won’t do. In this case, the “dirty” job is to investigate a certain tomb. I wouldn’t be surprised if the name of this tomb rhymes with “Jazamick”; then again, maybe not. We shall see. 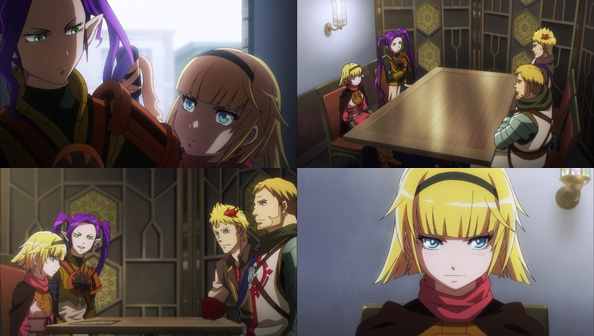 Fortnight (note the different spelling from the popular video game) is composed of the fighters Hekkeran and Imina, the crusader Rober, and the mage Arche, daughter of one of the “incapable” (i.e. incompetent) noble families that Emperor El Nix has stripped of their nobility. Arche is a third-tier magic user who can also detect the levels of other users. She uses these talents to make money to pay off her family’s debt, but when she returns home to find her father still spending money he doesn’t have on trinkets, she decides to officially freeze her folks out (her mom doesn’t get to speak), and vows to take her little sisters and make her own way—which would mean no more dangerous adventuring. The other members of Fortnight declare other reasons, but you can tell they care about Arche and want to help her and her sisters stay above water, though if she leaves them they’ll definitely miss her magical prowess. The next day, Fortnight joins a bunch of other Worker teams of various dispositions on the grounds of their client, Count Femel. They are also introduced to Momon and Nabe, who’ll be joining them on their quest. 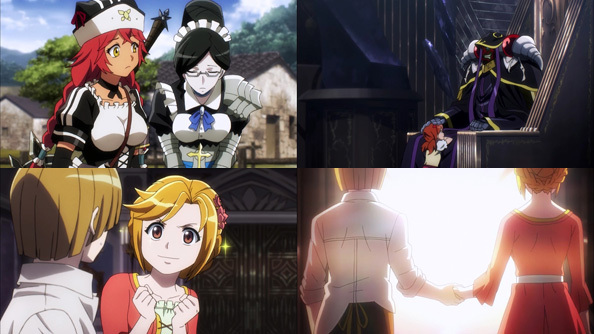 Their presence makes me less sure that the tomb they’ll explore is Nazarick, but whatever tomb it is and whatever’s waiting for them, with Momon and Nabe around, the Workers are going to get a good show.